Carol Mackenzie Gale B.A. (Hons) M.A. : GORGEOUS SUNNY DAY! How we pine for a hot sunny summer. It is gorgeous today but my studio is like a sauna. Within 5 minutes I was pouring, dripping and I had to leave. I daren't touch my lovely vulnerable silks. I went up there to photograph my silks with my new camera but it was just too hot. How often do we say that?? 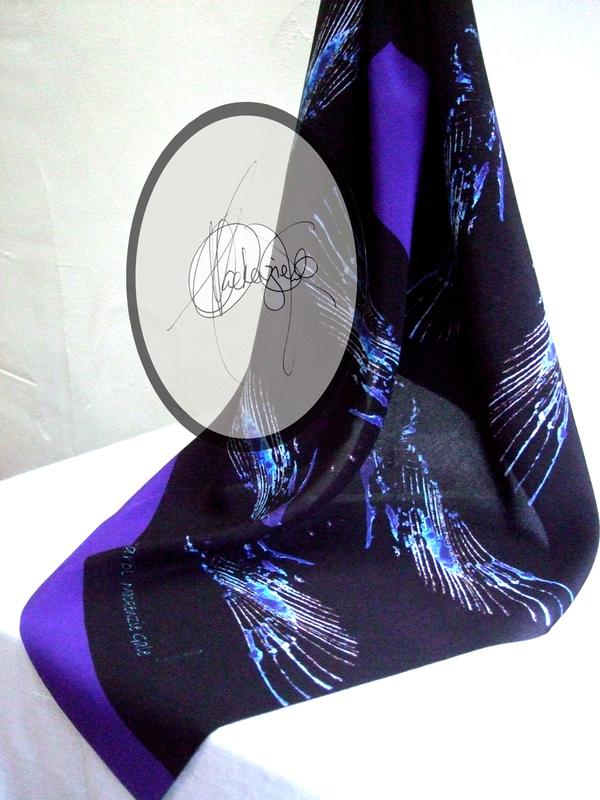 'Blue Angel' scarf. Pure silk. Bespoke design, 70 cms. sq., 90 cms sq., 135 cms sq. Experimenting with watermarking. 'Zen Awakening' scarf. \pure silk. Exclusive design. These designs have quite a story. Each was inspired by the study of 'Zen' on my M.A. 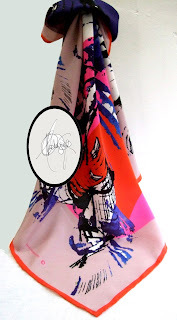 Ultimately, after much deliberation, I worked, in my studio, whilst in meditation, directly on to the silk. I surrounded myself with various brushes and tools. I used a layering of dyes which were not compatible, steaming them at times different to those recommended. I often screen printed a 'base' design, a structure, and then meditated, and whilst in meditation, printed blind onto the silk. Some of the images looked like Angels, birds and other creatures, quite amazing. As the Zen Masters do, I worked from the 'Soul Centre' rather than with the eyes. Working in meditation from sound was an amazing experience. Other senses, such a hearing, were magnified, isolated, as in those of a blind person. I opened my studio doors. My sheep collected outside one door, maaing gently while in the field opposite my studio, buzzards gathered being dive bombed by crows. Their peace, their fear, their squawking as they dived, the contented pheasants gently clucking as they gathered stray corn, the sounds all went into the pieces. Later I took these images into my computer to create the above scarves. Hopefully, they will contain the healing elements which come with the 'Zen' and healing meditation. I am planning to work this way to produce my beloved Opera Capes and jackets. Watch this space!!!!! !